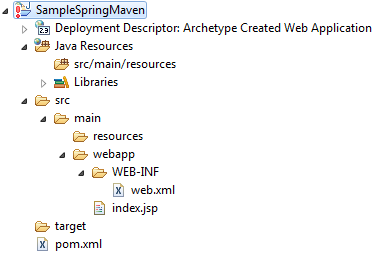 In this particular blog we will discuss how to create a Spring Web Project in Maven and how to make it support eclipse IDE. 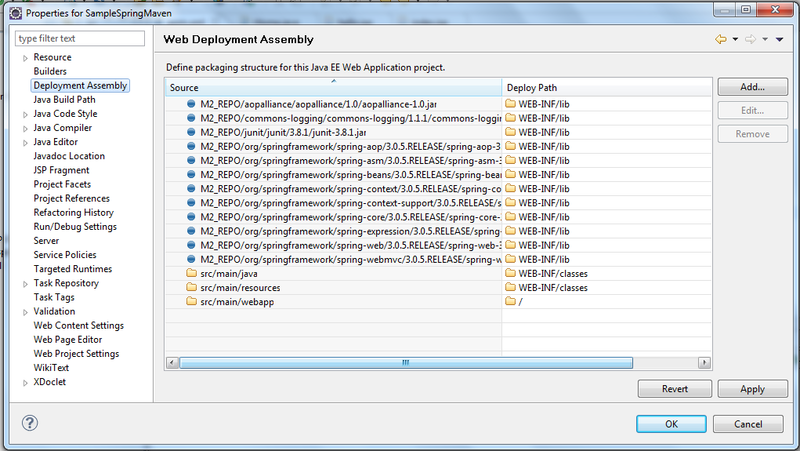 Now we are done with creating a simple dynamic web project in maven and imported it in eclipse. 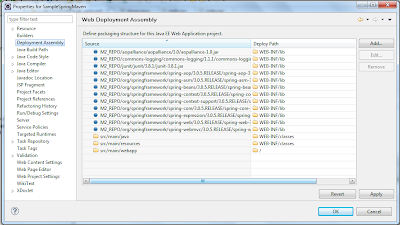 Lets add some required files to it to make it a Spring MVC project. This is the most critical step in importing maven web app in eclipse process, make sure all jar files are referenced here as shown in above image. If not, run "mvn eclipse:eclipse -Dwtpversion=2.0" command again. Deploying Spring Maven application war to apache tomcat using tomcat-maven plugin. 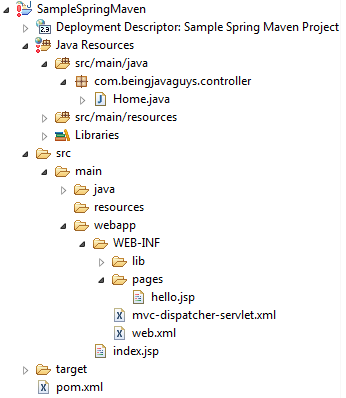 Till now we have created a spring maven project and imported in eclipse. We also run the project from eclipse. Now lets see how to create a war file uisng maven and deploy it to apache tomcat server directly using tomcat7-maven plugin. 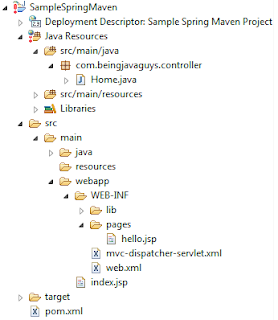 Deploying maven created war file from eclipse to external server is a three step process. We have already added the plugin in pom.xml showed above. Step 2 : Add a user entry to '..\..\apache-tomcat-7.0.41\conf\tomcat-users.xml' file in your server. Thats it, now lets deploy our application 'war' file directly to external tomcat server. 1 - Start your targeted tomcat server. 2 - Navigate to your project's parent folder and supply following commands. 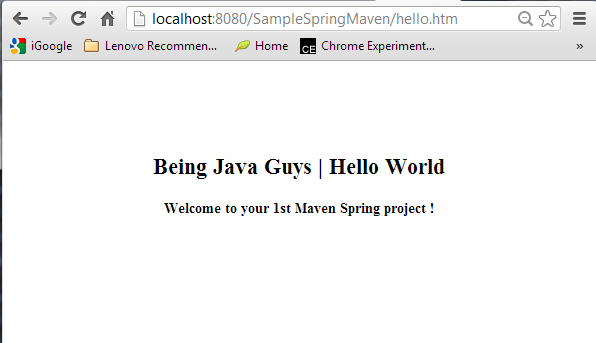 Now open browser and hit 'http://localhost:8080/SampleSpringMaven/' you will get your allpication deployed on server. Every time you make a change in your code apply last three steps 'mvn clean','mvn package' and 'mvn tomcat7:deploy'. You can use 'mvn tomcat7:redeploy' instead of 'mvn tomcat7:deploy' if case of re-deploying same app's war again on server. 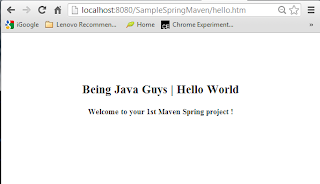 In this particular blog we came across 'how to create a spring web project in maven' and 'how to deploy spring maven project war to tomcat' in upcoming blogs we will see more about 'Maven', 'Spring', 'Java' and other opensource technologies.